No, this isn’t a small pretzel. It’s a 400g loaf of something called fougasse, a semi-flat bread related to Italian focaccia. I remember my neighbour mentioning it, as we both shop at Bread & Cie on 5th. I’m glad I took a picture of it, because it was gone in about 10 minutes. It was so good, and I was really hungry after 4 days of heavy riding, that I finished it all in one sitting. It’s wonderful eating freshly baked gourmet bread without any guilt. Since going low-fat (< 10% of calories), and trusting the science on de novo lipogenesis (DNL), I eat this stuff until I’m full. The carbs just get stored as glycogen in the muscles, and not as fat in adipose tissue (no matter what Gary Taubes says). 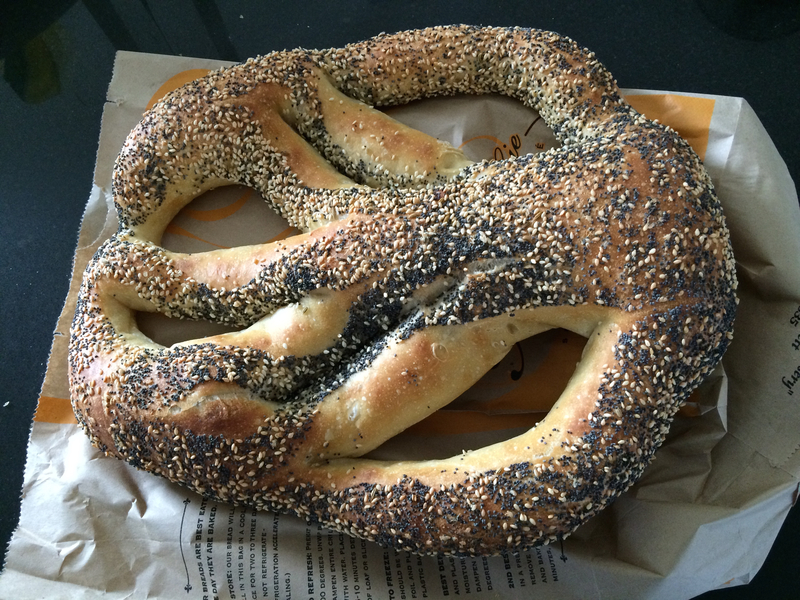 This fougasse was so soft and fresh, and the anise and sesame seeds added a nice aroma. It really hit the spot. This is the way people should eat. I can’t believe I used to be afraid of bread. I had to prove to myself that a pound of bread a day was safe (by losing weight eating 30 lbs of bread, and by researching DNL). Now, count me in the low-fat, plant-based camp again. Today is a rest day with lots of carbs to replenish the glycogen stores. At most, I’ll take a 5 km walk before dinner. Then I’ll cook up a big bowl of noodles, some popcorn, tortillas, etc. While some people think about restricting calories, I only think about what I’m going to eat next. This is very interesting stuff… I found the explanation about no “free” calories when one eats excess fats with the carbs very revealing… Kudos! As a follow up… Is it not true that no food will cause you to gain weight unless you consume more calories than your body needs for energy? Also, where do avocados fall? They are fatty, but aren’t they different from a “fat” perspective? Thanks! Right, if you don’t eat excess calories, then you won’t gain weight. Likewise, you can lose weight eating fat, just as long as you burn it. I love avocados. There’s not that much fat it them. Plus, if they’re more satiating, then you’ll eat less of other foods. In general, there’s nothing wrong with fat. I’m just trying to avoid it now, to try to lose those final 8 kg quickly. But, this low-fat experiment might not work, because I might end up eating more calories, and slow my weightloss. We’ll see. I’ll learn from this. I was wondering if the bakery was missing you! That’s an interesting loaf of bread.